Cocktailians: How Is This Drink Different From All Other Drinks? How Is This Drink Different From All Other Drinks? But ever since moving to New York, where there are a lot more Jews around than the Southern burgs I came from, I've been fascinated by some aspects of Jewish life, and none more so than the Seder dinner at Passover. I've not been to one -- either I haven't played my cards right or I've been stuck at work -- but I think the ritual is interesting, and I enjoy that it's a celebration open to all. 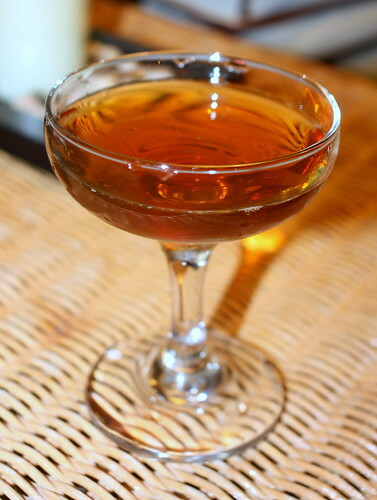 I was reading up on the traditional ingredients on the Seder plate, and thought that it'd be fun to combine a few of them into a Passover cocktail. I'm not getting nearly as elaborate as the guys at Sipping Seder (really, you should go check that link out; they've come up with really good-sounding cocktails for each element of the Seder meal) or the other restaurateurs or bar owners quoted in this Tablet article, but I did want to see if I could combine the bitter herbs (maror), which symbolize the bitterness and the suffering of the Israelites in Egypt, and the charoset, a sweet paste that symbolizes the mortar that the Israelites used for bricks there, and put them both in a drink together. After all, balance -- of sweetness and bitterness, as well as other flavor profiles like sourness -- is one of the hallmarks of a good cocktail. Some notes on ingredients: For the apple brandy, I used the wonderful Clear Creek 8-year-old Eau de Vie de Pomme, though I think any good Calvados would work just fine. For the wine, I used BV Muscat de Beaulieu, which is inexpensive and not-terribly-complex, but did the job: I was after those dessert-wine notes of sweetness, raisins, and other fruit. I think any Muscat would work equally well, and possibly other dessert wines would fit the bill, though that may lead to the need for adjustments. The cinnamon syrup is available from Trader Tiki, but I used homemade: a 2:1 simple syrup in which I steeped several cinnamon sticks for four hours. I should note, also, that you're on your own if you drink four cups of this cocktail, as the Passover ceremony dictates with wine. And, more seriously, no claims are made that this is kosher. I enjoyed your post. Thanks for your kind words about our project, The Sipping Seder. If you try any of our cocktails, let us know what you think. We definitely look forward to tryig out your "Seder Ain't So." Great post. Thanks. The Seder Ain't So cocktail sounds brilliant and I can't wait to mix it. Clear Creek makes some amazing products. Have you had an opportunity to visit their distillery? It should be on your list if you're ever in the Portland area. Thanks, Lynne! I did visit the distillery last year, and enjoyed it greatly. PDX has some fine drinking opportunities.